All in stock, ready to ship. Psion 7530 Battery Charging + Docking Station. Psion Art.No. 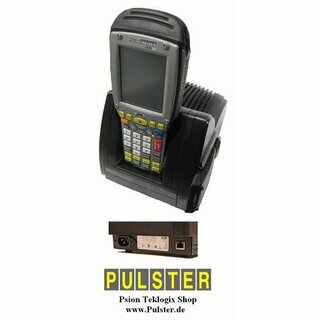 : HU4002 "Dual Unit Charger - 7530, 7535", P/N: 1080214. Charging: battery in unit and a second charging cradle for another battery. Communication: Station can be connected to PC/Network via Ethernet port. Suitable for Psion Teklogix 7530 and batteries CV3000, CV3001. What you get: docking station, incl. integrated power adapter, power cable and quick manual. Genuine Psion product, refurbished, clean and checked, with 1 year warranty, ready to ship. Regular price 447 eur ex.VAT, limited special offer.